Pursuit Hunting: Reds or Whites - Which Goes Best With Deer? If you've found your way to this site by way of a search engine , chances are good that you were looking for a discussion of the merits of pairing cabernets versus chardonnays with your favorite venison recipe. If so, sorry to disappoint you, but that would be a worthy subject for an article down the road. Right now, we are talking acorns (we aren't going to eat 'em, the deer are). Acorns are perhaps the most important food source available to deer during the fall and winter. They are high in proteins, fats, and carbohydrates, making them a much more balanced food source than agricultural crops or browse. They are one of the richest sources of calories for maintaining energy during the rut and for packing on the fat for winter survival (I think my wife must be slipping some acorns into my cheeseburgers - I'm talking about the fat thing, not the other, in case you were wondering. Remember, this is a family site!). Relatively large quantities can be eaten quickly, minimizing exposure to predators while feeding. Any time acorns are available, you can be assured they will make up a significant portion of a deer's diet. That's why they are central to the dominant tree approach to deer hunting. Like wines, acorns (and the oak trees they grow on) are not created equal . Oak trees are divided into two families, the white oak family and the red oak family (does the wine reference make sense now?). The white oak family includes white oaks, chinkapin oaks, chestnut oaks, overcup oaks, burr oaks, and others. Major species in the red oak family include northern red oaks, southern red oaks, black oaks, pin oaks, and blackjack oaks. If you don't know a blackjack oak from a pair of aces, hang in there. We're going to get to tree identification in a few days. I can only make this stuff up, er, do my research so fast! 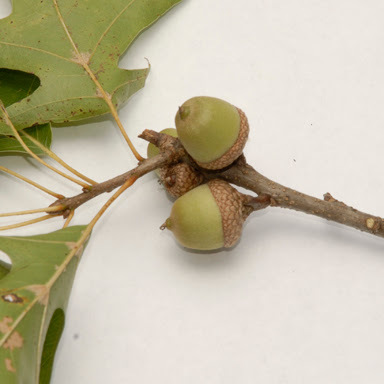 Other than their appearance, the primary difference between the two oak families is that white oak flowers are pollinated in the spring and mature into fully-developed acorns that fall. Red oak flowers are also pollinated in the spring (generally a couple weeks before the white oaks), but they do not mature into fully-developed acorns until the following fall (16 - 18 months later). For that reason, red oaks will sometimes have fully mature and partially developed acorns on the same tree as you can see in this photo of pin oak acorns. As I write this article in the fall of 2007 after an extremely harsh late frosts and the worst drought in the history of the southeast, it is obvious that the different maturation periods are part of an amazing natural adaptation that prevents an entire year's acorn crop from being wiped out by natural events. Whether this spring's hard freeze killed the flowers or the hot, dry summer baked the developing nuts, I can't say, but this year will not be a good one for white oaks in the southeast. Despite frequent trips to the woods in Tennessee, Alabama, Kentucky, and Illinois, I have yet to find more than a couple acorn-bearing white oaks. On the other hand, the members of the red oak family such as the southern red oak pictured above and the blackjack oak pictured here are doing well. Both photos were taken during the past two weeks. The exception in the white oak family are chestnut oak acorns which are very high in tannin and thus very bitter (I guess that would make them the "Ripple" of the acorn world). They generally are eaten by deer only if there are no other varieties available. Pin oaks seem to be an exception to the red oak - high tannin rule. Their orange-ish nuts are quite sweet and highly sought after by deer. The following list is certainly not scientific, but it represents my observation of deer's relative preference for the various types of acorns that are common in my hunting area. I have developed it by noting the species of acorn chosen by deer when multiple species are available. Species listed at the top seem to be preferred over those lower down. So next time you are choosing between a red or a white wine to go with your venison dinner, think about the acorn connoisseur on your plate. In the next Scouting 101 article we talk about factors that influence the number of acorns produced and how to locate a productive tree.